Contain more than twice the amount of ink compared to genuine Epson Fox cartridges. Each cartridge is packed in a retail box. Each printer cartridge individually vacuum wrapped. We have been selling quality Epson compatible ink cartridges since 1999 and have tens of thousands of satisfied customers who purchase from us on a regular basis. Cheaper inkjet cartridges commonly utilise out of date chips and low grade inks that can cause problems with your printer. 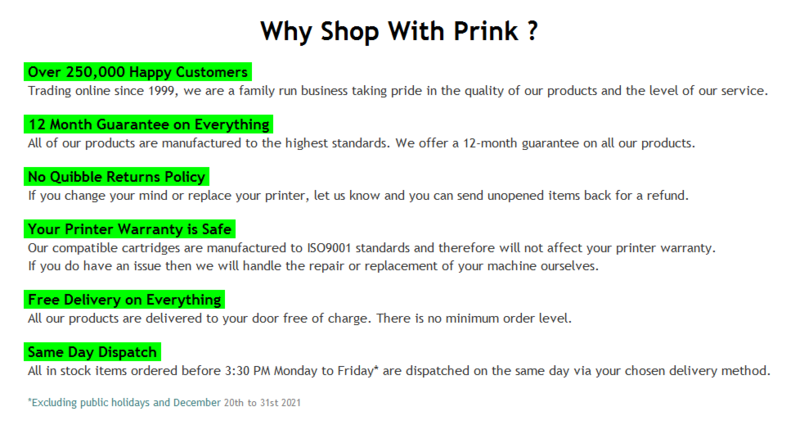 With Prink you can rest assured that you are buying the best quality ink cartridges from an established trusted supplier. All our cartridges are covered by our money back guarantee and in the unlikely event that you do experience any problems then our expert technical staff are always eager to help. I had no hesitation in purchasing again. 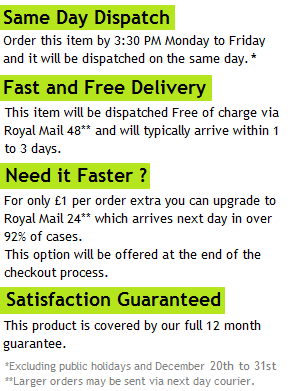 Very satisfied with the inks, very competitively priced indeed, and delivered in 48 hours. Excellent!! Use in home printer,print quality is as good as proper epson cartridges. I tend to go through the black ink quicker than the others, so this combination works best for me.I have recommended your company to friends,family, and work colleagues.The quality of the product is excellent. products (cartridges) to be used in my Epson printer . Use the product for all printing from computer printing.Quality of ink excellent.Would recommend to anyone wishing to use it in a computer printer. Home use.recomend to friends and family.Instructions of product,clear and easy to follow. I use this product in my printer with great results . Again fast service,good quality ink. The Epson SX130 printer is used at home on an irregular basis usually for printing photographs as my other printer (Epson RX425) does not produce the same quality prints on that function. Well pleased with the quality and value of product. Ordered one day received the the next. Hi, I am pleasantly surprised by your service, it is very rare these days to get the service and help you all gave me. The delivery was next day...I ordered at 3pm received 9am next day...I couldnt believe it, I thought I had missed a day!!!!!! Thanks so much. Excellent value for money, and received the next day, will be using you again. I would like to express my thanks for a very prompt and efficient service. The order arrived within a few days. Price is excellent and quality as good as the originals at about a third of the price. Well done Prink. I know where I will be getting Ink from now on!!!!! Thanks for the excellent service and communications. The goods arrived safe and sound today as promised. It doesn’t get better than this. I've just tried the cartidges and it just got even better. 1 x Multipack Compatible with Epson T1285 PLUS 1 EXTRA BLACK5 Perfick! Very impressed by service, ordered Thursday night, order arrived Saturday morning.